Welcome to Down On The Street, where we admire old vehicles found parked on the streets of the Island That Rust Forgot: Alameda, California. We're going to end 2008 with the oldest DOTS car yet. How about 89 years old and parked on the street? 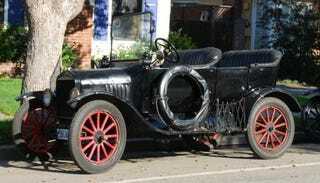 Granted, this West End car doesn't live full-time on the street, but every so often it spends a few days doing so, along with its 1924 garagemate. At that point it's used to run errands, go grocery shopping, and so on, though it seldom leaves the island and its 25 MPH speed limits. The owner is a regular Jalopnik reader, and he agreed to let me know the next time his old Fords would be getting some street time. Got to love the uncomplicated controls. Ignition switch and ammeter. Period. The Model T was 11 years old by 1919, and old Henry- in between foamy-mouthed fulminations on the Elders Of Zion- was working double-time to get costs down. You could get the '19 Touring for just $525, or about $6,500 in today's bucks (the '08 model went for $850). And hey, this was the first year of the electric starter, so broken wrists became optional!